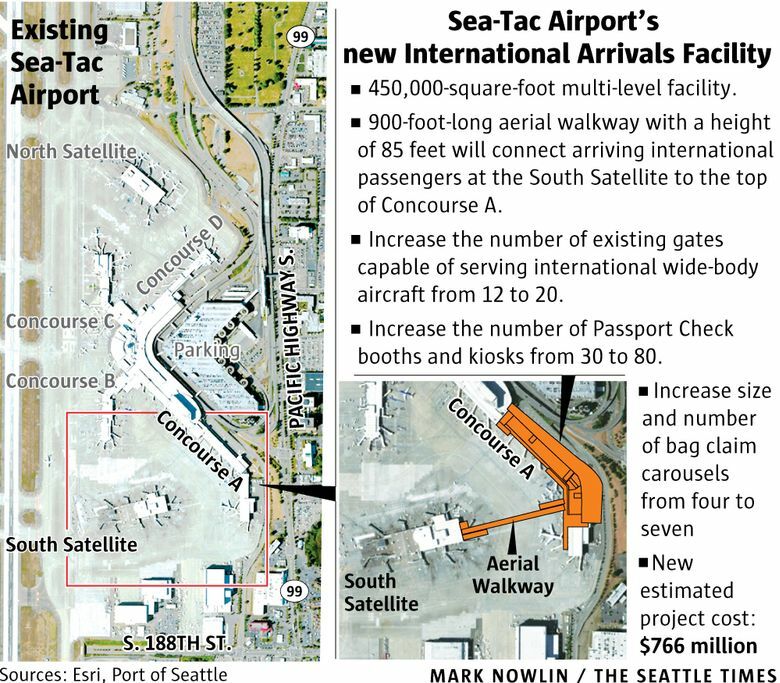 Port of Seattle Commissioners on Tuesday unanimously approved an extra $213 million for two major construction projects at Seattle-Tacoma International Airport, then celebrated the formal groundbreaking of one of those projects, the new International Arrivals Facility (IAF). Port of Seattle Commissioners on Tuesday unanimously approved adding $213 million to the budgets for two major construction projects at Seattle-Tacoma International Airport, citing more defined cost estimates as the designs have progressed. Later in the morning, airport officials hosted guests for the formal groundbreaking of one of those projects, the new International Arrivals Facility (IAF). The IAF, which will streamline and expand access for passengers arriving from other countries, is set to open in 2019. Its budget was increased 16 percent to $766 million. The other project, the North Satellite renovation that will expand a terminal used exclusively by Alaska Airlines, has already broken ground. The first phase will be completed by 2019 and the work finished in 2022. The North Satellite expansion’s expected final budget was boosted 19 percent to $658 million. Speaking for the airport’s largest domestic carrier and second largest international carrier, Alaska Air Group chief commercial officer Andrew Harrison said his airline fills the equivalent of a dozen Boeing 737s every day with passengers connecting from international flights. The expected final budget for the IAF project has not yet been determined, which means costs could potentially rise further. Airport spokesman Perry Cooper said determination of the “Guaranteed Maximum Price” for the IAF could come as early as next month.